I did a whole lot of cooking over the holidays. My mom visited, and with her specialized diet every meal needs to be made from scratch. Among other things, she avoids gluten, dairy, soy, nuts, chocolate, banana, most egg, and most spices including basics like pepper. With six folks here to feed, I made a ‘mom’ or ‘mom and me’ version of each entree and one for everyone else. I cooked with fish much more than usual since it was one of the few protein sources that worked for both her and us. I made burritos with Sonoma Gluten-Free Wraps (I have no business relationship with them, I just like their wraps). They’re made with whole grain teff and millet as well as the much less nutritious tapioca flour. 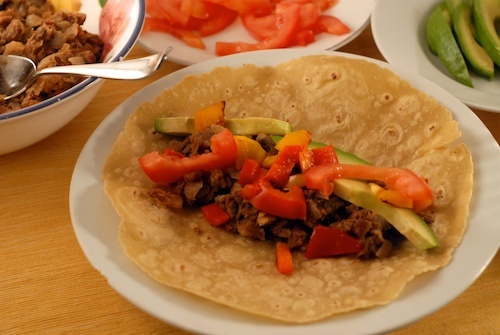 I cooked refried pinto beans with just onions and salt for my mom, and with chipotle chile, cumin, and coriander for the rest of us, and offered tomatoes, avocados, and sauteed bell peppers. 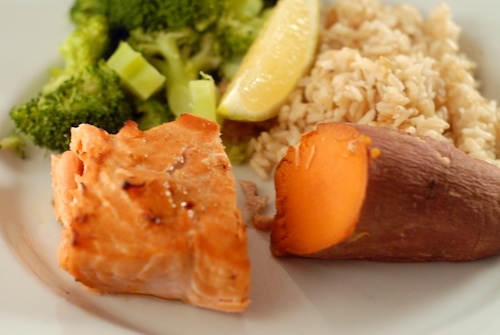 For another dinner we had broiled steelhead with a tasty miso glaze, plain steamed broccoli, yams, and brown rice. For my mom’s piece I made a glaze without miso (no soy for her). This kind of meal is pretty much what my mother lives on: rice with fish and vegetables. And it’s one of the few things she can order at a restaurant, asking for the fish to be grilled plain with no flour or spices. 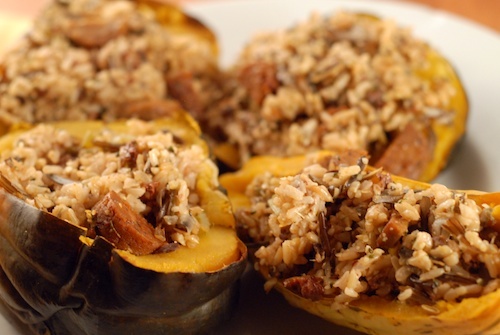 The next night we had acorn squash stuffed with wild and brown rice. This is something we make often; my son made a really good version recently with dried figs, walnuts, and feta. This time I added celery, raisins, and Field Roast Vegan Sausage. Again, just a product I like, they don’t sponsor my blog or anything. I left the Field Roast out of the gluten-free portions since it contains wheat gluten. That removed the main protein source from my mom’s dinner, so she had chicken that she prepared herself to supplement the stuffed squash. 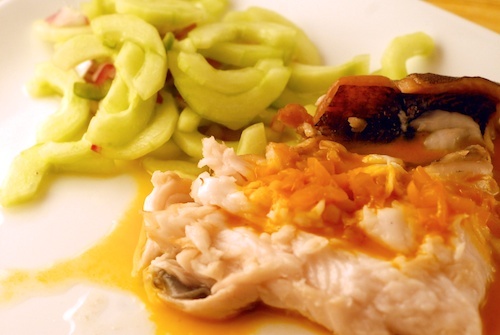 One night we had black cod with cucumber salad and carrot vinaigrette, a recipe from Becky’s Selengut’s Good Fish. 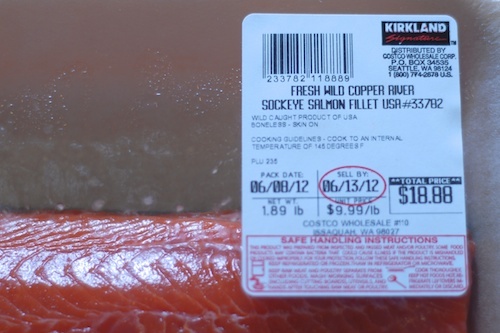 Good Fish is a worthy cookbook by a Seattle-based author with lots of information about sustainable seafood. This recipe is adapted from Jerry Traunfeld, owner of Poppy Restaurant and former chef at the famous Herbfarm (I’ve been to Poppy but the Herbfarm has always remained stubbornly out of my budget). The carrot sauce in this recipe, made from reduced carrot juice, intrigued me. I’ve made it several times, and it’s been thinner than I wanted except when I reduced it much more than the instructions, so I’m ready to do some tweaking of my own. I had bought whole black cod on a special from Costco, a decision I regretted as I spent literally an hour filleting the fish, picking all the pin bones out with needle-nosed pliers. Preparing that fish certainly brought out my more purely vegetarian leanings. 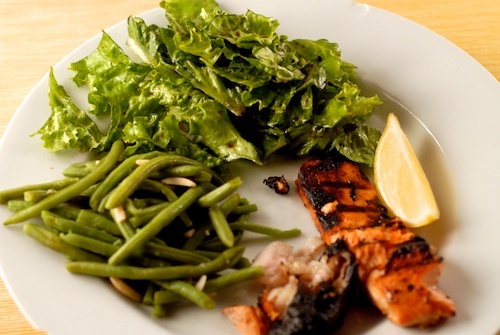 Later on we had yet another fish dinner, wild salmon marinated in the leftover miso glaze with bourbon, sugar, and water added, plus leftover black cod, a green salad and green beans. For Christmas dinner itself, we had our traditional chestnut stuffing, yams, and mashed potatoes with vegetarian onion gravy. Mom did not want me to try to make a gluten-free stuffing, she just skipped that. 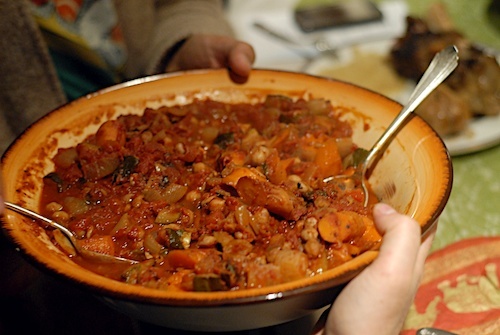 I had folks over for dinner a couple of days after Christmas, serving recipes from Fit and Fed like Pear, Hazelnut, and Goat Cheese Salad and Sweet Potato Vegetable Soup with Ginger, Cilantro, Coconut, and Lime. For dessert I served Jewel Cookies, which are a recipe from my husband’s grandmother, and a homemade eggnog ice cream I’m experimenting with. I made a separate version of the soup and salad for my mom. Although my mom’s diet is strict and difficult, the restrictions in effect force her to eat healthy food. There’s hardly any dessert she can have (I’ve made her a few), and most processed food is out. It is hard, though, for her to get enough to eat with all the restrictions. It makes for a good cooking challenge for me while she’s here and keeps our meals very healthy and from scratch. 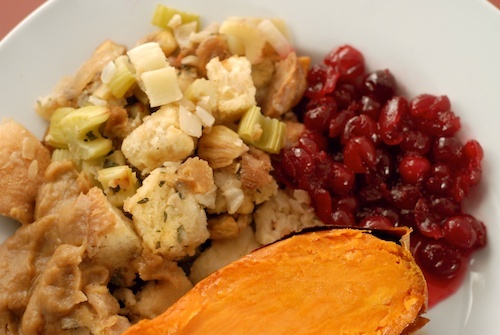 All that energy that could have been devoted to some pretty decadent holiday foods went into these dinners instead. Though one of my sons took up the slack by cranking out batch after batch of cranberry-macadamia nut chocolate chip cookies, of which I ate plenty. It’s nice to have more chefs in the house! 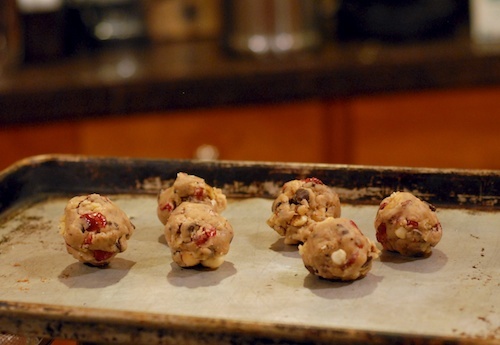 Dried cranberry macadamia nut chocolate chip cookies ready to go in the oven. 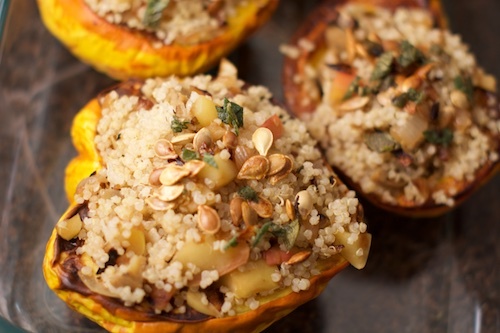 Sage Apple Quinoa Stuffed Squash Squash stuffed with sage, apple, and quinoa, topped with toasted squash seeds. 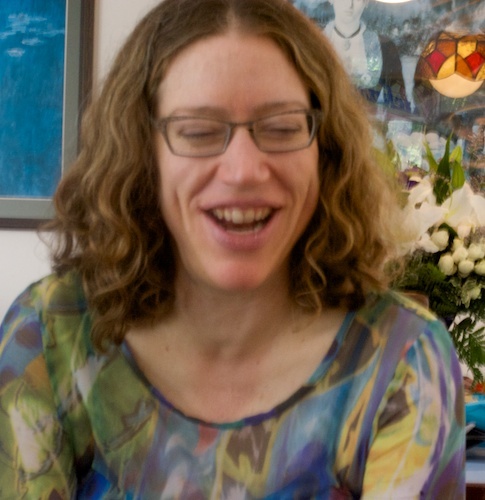 I am GF, but could not imagine being soy and dairy free too. That would make things so much harder. It is a challenge, especially with more besides these three. That is so sweet of you to go to all the trouble to make separate meals for your Mom and to try to mix it up for her too. I also have a very restricted diet and I know how difficult it can be, especially on others. Well, gotta keep her fed! I think she likes a break from meal planning and from cooking, at home she cooks for herself for every single meal. Mmm everything looks beyond fantastic! Everything looks amazing. My aunt has a lot of dietary restrictions as well. So anytime we have Thanksgiving with her, I know the food will be super healthy. I’m sure your mom appreciated the extra effort that went into her meals! That’s some tough cooking challenge! I guess once you get used to cooking without all our staples, it gets easier. The dishes sure do look good! This food looks soo yummy! That is so great you make the effort to make your mom special food. My husband is diabetic so I am always trying to find good sugar free recipes. For a diabetic he really has a sweet tooth!! I appreciated all the delicious food Mary prepared for me.